Hamid Karzai’s hands show that he is a clever and glib talker, and extremely shrewd. A difficult man to upstage. The United States is finding this out now, but even a cursory glance at the President of Afghanistan’s hands reveals that he is as smooth as they come. a practical, common sense approach to his cause. He will compromise if he feels the situation demands it, as long as it achieves his goals. Karzai's flexibility is shown by several signs. 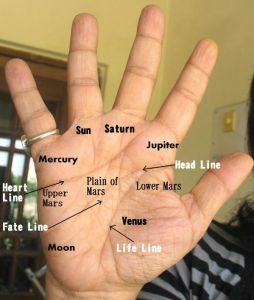 The shape of his hand, thumb, Mercury Finger and Quadrangle, all point to it. He can be impulsive as well. That he is not rigid and fixed in his views, that he readily sees another point of view, maybe a desirable trait in a politician, but the current situation in Afghanistan is such that there is an ever-present danger of Karzai being won over by dangerous factions. Here are some photographs of Hamid Karzai's hands, here and here. If he recently threatened the United States that he would join the Taliban, then he has considered it! There are some in the American establishment who feel that Karzai is not serious, but the Afghani President has an uncanny knack of sizing up a situation and going half way to meet it. He is a survivor, and has survived precisely because of his ability to change colours. Hamid Karzai's Jupiter Finger and Mount shows that he wants power above all else. If he feels that the U.S is giving him the better deal and protecting him, he’ll stay friends with the U.S. but if the Taliban can do it, then that is where he will be tempted to go. His hand is not balanced in this regard. For people with hands such as his, democratic values don't mean much and despotism comes naturally. In addition, Karzai's Mercury (little) and Jupiter (index) fingers show that he is a master manipulator. He plans his moves very very carefully. Does his hand show that he has principles? Well, he loves his country, there is no doubt about that. However the idealism and high-mindedness of his early days has been replaced by cynicism and bitterness, shown by the shape of his Saturn finger and the Lower Mount of Moon. His Mount of Venus shows that he has become reserved over the years and does not have the same love for people in general as he had earlier. These are not good signs in a political leader. He has a good thumb, showing the ability to reason and think, and also the ability to command others. The main problem in his hand is the craving for power, which is out of balance with the rest of the hand. This trait, in combination with his ability to understand another's point of view, impulsiveness and commonsense approach to problems means that he can change. Karzai is not someone to mess with. He has enormous powers of resistance (Mount of Mars) and a strong hold on people close to him. He is not overtly aggressive (Mount of Mars), and this is partly due to his refined nature. Like all successful politicians Hamid Karzai doesn't use brute force to get his way. Money by itself means little to him, it is power and status that he wants. Power above all else. Or read about the difference between Indira Gandhi and Margaret Thatcher. Or check out the hand analysis of other world leaders and politicians, from the West and the East. True, but what about those who say things without thinking deeply and then regret them?